Please watch out for fraudulent emails offering bankers draft with overpayment supposedly from Dublin. We are interested in any Esprit needing work ie Painting, Retrimming, Blown Engine, Accident Damaged, Unfinished Restoration Projects or if anyone is after a quick sale. Top prices paid. Any condition considered. Private buyer. Remember adverts stay on here until sold, so if you contact a seller and find out the Esprit has been sold, please contact LEW so we can remove it, as some sellers forget to contact us once their car has been sold. I am after an Essex Esprit Turbo for personal use in any condition will travel anywhere for it and pay the best price for it. If you do have one and are considering selling it please call Mark. I am after an JPS Esprit for my own personal use and collection I will travel anywhere for it and pay the best price for the right car. If you do have one and are considering selling it please call. "I have had a fantastic amount of response, due to the exposure of my car. I have sold the car within 4 days of it going on LEW, and today the new owner has come to collect. I can not thank you enough, this has been far better than any other avenue I coud have tried." 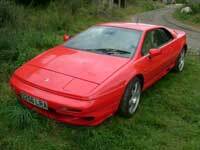 Once again Many Thanks from a very satisfied ex Lotus Esprit Owner." "Just a quick line to let you know my Esprit Turbo has now been sold!. What can i say? WOW! I never expected to get a response like i have had. Auto trader eat your heart out! 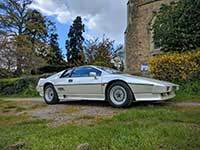 "Just to let you know my Lotus Esprit has just sold on Saturday. Not bad only advertised since Wednesday. Great service by yourselves and also very good value for money. Thank you very much"
eventually sold to a lady in Germany"
So you can see what models have been available and purchased. Please note, that due to a few customers not informing us of when their Esprit is SOLD, adverts over a year old will be removed unless the advertiser contacts us before this time. If the car is still for sale, then the advert will remain. If it's removed and the advertiser still wants to sell the Esprit, then they'll be a £5 republish fee, so make sure you tell us before the years up. This vehicle was recently purchased by us from a car collection along side another red Lotus Esprit S2 which is in identical condition. This is a 1979 car with only six previous owners and has only covered 60000 miles and which only can be described as in outstanding condition. This along side the red S2 are honestly the best condition ones I have ever come across. Lots of recent recommissioning work has been carried out. Viewing is highly recommended as the pictures do not do the car the full justice it deserves. Any inspection is welcome. Finished in Essex blue metallic with grey half leather interior. With full glass removable roof including the original roof bag and wind deflector.. This car has only covered 51,000 miles and has only had two previous owners . It benefits from a recent full service including rear brake calipers refurbishment. Last year the water pump was changed with a new cam belt. An excellent example of a turbo Esprit from this era. Any inspection is welcom. Finished in Calypso red with cream full leather interior. The Esprit HC turbo was probably the best of the Giugiaro model Esprit's don't just take my word for it let Harry explain here. This is a chance to own one of the rare Giugiaro model HC Esprit Turbos one of only 136 made for the domestic UK market and one of only 42 made in Calypso red . This being registered on an E plate is one of the last ones. This car has only covered 75000 miles, it is currently showing 15000 miles as the speedometer was changed at 60,000 miles this is documented in the paperwork and I even still have the old unit. The Lotus has a large history file including the original service wallet and old MOT certificates going back to 1990 and has only two previous owners. Over the last nine months this car has had a major overhaul with a full high standard repaint and a new leather interior which was done by a Lotus specialist . Also a major service with all belts and a refurbished water pump it now runs and drives as good as it looks. Finished in Norfolk mustard with raven grey full leather interior. This car has only covered 47000 miles and comes with the original service/hand book which has 11 service stamps in it. The S4S was known as the best four cylinder Esprit made before the Esprit became a V8. The car runs and drives fine and will come with 12 months MOT. The interior is in very good condition. In 1999 the lotus was damaged and repaired and is listed as a CAT . Currently the N/S fuel tank has been blocked off so it will require a fuel tank. The body could do with tidying in some areas but this is priced very keenly as a like for like not on the register would be priced at around 35K If you are seriously interested in this car please call Mark on 01245 248143 or 07732 339759 for further information. Please do not email me as I can't guarantee all of these will be answered. 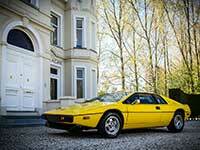 This is a very rare opportunity to own the most sort after of all the Esprit models. The Essex Commemorative edition was launched to commemorate the launch of the new Turbo Esprit in collaboration with Essex petroleum who where the main Formula One sponsor at the time and was unveiled at a party hosted by Essex in London's Royal Albert Hall. However the planned 100 commemorative cars where cut short, meaning that only 34 production Essex commemorative cars have been recorded, 23 for the domestic UK market and 11 for the export market. This information has been provided by Lotus Cars. This car is Essex No. 018, Chassis Number 10942 according to records there are only 13 Essex cars left in the UK. I have owned this car for 5 years in which time it has undergone a full restoration with a full engine rebuild by PNM Engineering and a full mechanical overhaul the body was stripped and fully repainted to a very high standard and the interior has been re trimmed. The car has only covered 51,000 miles with a very large history file including the original owners handbook. If you are seriously interested in owning a piece of Lotus history please call. I can not guarantee all emails will be answered. Finished in pearl white with full red leather interior . This car has only covered 65,000 miles and comes with a large service history file including the original service handbook and lots of old MOT certificates. 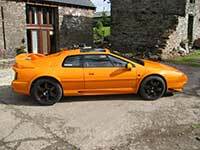 This lotus Esprit was last on the road around ten years ago. The car starts and runs fine with good oil pressure and good compression in all four cylinders but will require recommissioning. The paintwork is very presentable all round with some age related stone chips and marks. As far as we can see it will require a full service with all belts and fluids, all brakes refurbished and N/S fuel tank will need replacing or repairing. The interior will require new headlining and both seats recovering and two new front mats, the rest of the leather has faded but will recolonise. John Player Special no.22 out of 98. 1978 original car inside and out, interior in excellent condition with the original gold centre seats. This car is 39 years old with next year being the 40 Anniversary of Lotus winning the 1978 world championship with Mario Andretti. This car car requires a full repaint and recommissioning the interior is not to bad but does require tidying here and there. The last owner started to do some of the work but due to ill health could not carry on with the restoration. The engine turns over freely but due to the state of the cam belt I will not run it. Paperwork includes lots of invoices and old MOT certificates, the car has done just over 80,000 miles. I will also include a free genuine Lotus Esprit S1/S2 workshop manual to get you on your way with this great little project. In ice blue metallic with dark blue leather interior. This car has only ever had two owners in its life time and has only covered 27,000 miles. Recently had an overhaul with a full service,belts and reconditioned callipers. The lotus has had no use for the last 22 years hence the very low mileage but now is ready to go. I have some early service history with it including some old MOT certificates and invoices I also have the original service book with some stamps in it. These early Esprit Turbo’s are becoming very sought after and don't come along very often with this mileage. Any inspection is welcome. In pearlescent white, C-reg half blue leather, seats need some attention, factory removeable glass roof, wheels recently refurbed with recent tyres. brakes had a recent overhaul and is MOTed until march 2018. 48,000 miles. Currently running on new stainless offside tank only as for some reason car wont run when both are connected (not rusted). Is due a cam belt in september. Loads of history and owned for last 8 years and in that time serviced mainly by GST at Newmarket. £21,950. Finished in Essex Blue with tan and black leather interior incorporating black alcantara. This car has only covered 54000 miles with a very extensive Service history file including most of the previous MOT certificates, also including the original owners service handbook. In 2014/2015 the car underwent a massive overhaul with invoices reaching over £14,000 work included a mechanical and brake overhaul ,wheel refurbishment, new stereo and Thatcham approved central locking alarm system and lots of other parts the list goes on. In this time period the interior was also fully re-trimmed. 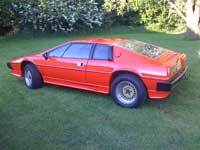 The car is in exceptional condition and is one of the best series 3 Esprit's we have owned. The car will come with a fresh 12 months MOT certificate , any inspection is welcome. In Black with gold livery and light tan half leather interior. This car has covered 96,000 miles and has stacks of service history including the original owners handbook with some early stamps in it. In 2001 at 80,000 miles a reconditioned engine was fitted to the car. The car would require a full service with belts changed and there is a list of other small jobs that need doing to it. Finished in Monaco white with dark blue leather interior and black carpets. This car comes with two large service history file books including the original owners handbook and has just had a recent service. The mileage is 71000 miles which can be backed up with all the service history. Fitted with a twin exit sports exhaust system and SE Esprit larger rear wheels. Finished in Essex Blue with blue half leather interior. The car has only covered 47000 miles with a recent full service ,new belts and water pump recon. The BBS alloys have also just been refurbished and a brand new set of Pirelli tyres have been fitted to all four corners. In 2004 the car was sent to SJ Sports Cars for a mechanical make over and just under £4000 was spent on it, the car has had very little use since then hence the low mileage, Will come with a fresh MOT this is an excellent example of an early Esprit Turbo. Any inspection is welcome. Lotus Esprit normally aspirated High compression, Finished in Monaco white with red leather interior only covering 82,000 miles in its life time , comes with a large service history file including the original service handbook. This is a very well sorted example with excellent paintwork all over and stunning interior with new carpets. Lots of mechanical work including replacement alloy fuel tanks and recent full "C" service will come with a fresh MOT. Any Inspection is welcome. This is my own personal car which I have owned for nearly six years. Early Series 1 car with the single lift headlamp motor. In the six years I have owned it the car has been completely restored using my Lotus specialists body shop [Stocks coachworks]. 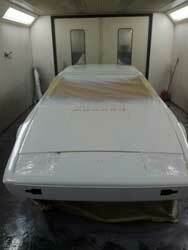 The car has had all the old paint removed back to the Gel coat and has been fully repainted in Lotus Monaco white. It has been fully re trimmed in the tartan and green material with orange carpet as per the James Bond car specification. The engine has been fully rebuilt by PNM Engineering and it has a new full stainless exhaust system. All the suspension has been rebuilt or replaced , the car looks as good underneath as it does on top. I have made a service history file of the restoration and have invoices reaching just under £9000. None of this includes the countless man hours that where put into the restoration. Also so it must be noted that we have restored many S1 Esprit's and have won the Lotus Forums concours d'elegance competition with two of them in 2015 and 2016. Very rare car in this condition any inspection welcome. Finished in Calypso red with raven grey full leather interior. This is the first of the fuel injection Esprit models and this car has only covered 64,000 miles in its life time. I have a service history file with the car which includes the original owners handbook with 13 dealer stamps in it. We have recently given the car a full service with new cam belt and it runs and drives very well the car will come with a new 12 months MOT. Excellent throughout. The SE model is becoming a rare model in the Esprit range and low mileage examples are thin on the ground it offers a great investment opportunity as Esprit prices are only increasing. Any inspection welcome. In Calypso Red in great condition, 74,315 miles with history. Thatcham approved central locking alarm system, Brand new Full MOT & Taxed in my name last 7 years, Magnolia Leather refurbished, Owned by me since Nov 2008. OZ Route alloys with 4 great tyres. In White, with engine rebuilt. A Complete nut and bolt Esprit rebuild nearing completion to exact 'Spy Who Loved me' Spec. RHD British car. Serious enquiries only. £POA. As the internet gets bigger, more people are using it to rip people off. This site as been targeted by some low lifes who are just trying to steal from you. The most important thing is to make sure any transaction is real. Please check all bankers drafts with the issuing bank as an old scam is the fake ones are cleared by your bank, you release the car and then it's found and the funds are withdrawn. Do not except any over payments via bankers drafts or cheques, as this is part of the same scam. We have also heard of a buyer in Northern Ireland who is making a unrealistic demands on sellers and wasting their time. We don't advise you deal with this man. Please be careful and feel free to contact us if you have any concerns about a buyer for advice.